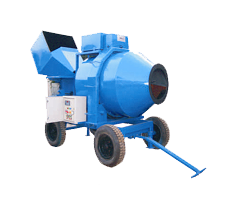 WALIA MOBILE BATCHING PLANT production capacity 12 to 15cum / hr, 3 bin hopper with hydraulic tipping (capacity 1450 kg). Drum powered by 10 h.p Gear Motor. Direct water flow meter, 125 Ltrs stand by water tank. Load cell based weighing system with digital display per batch. All control from one control panel by single operator. Batch wise print out system. Manufacturer as per IS 4925:2004. 1. Batch Wise Tabulated Print Out.